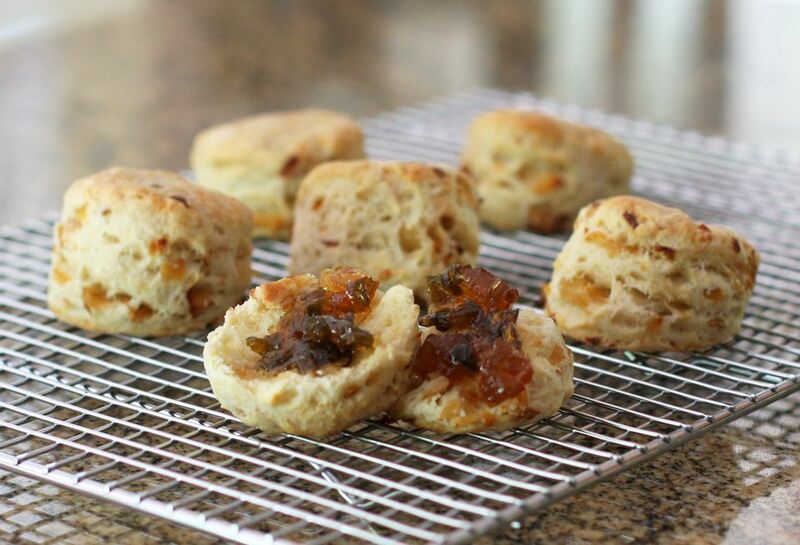 Caramelized onions make these delicious biscuits slightly sweet and moist, and they are wonderful with a variety of spreads. Use an herb butter, a cream cheese spread, or your favorite chutney or hot pepper jelly on the biscuits, or use them as sandwiches with slices of roast beef, ham, or chicken. Use a small biscuit cutter to make mini biscuits. The onion flavor makes the biscuits them an excellent base for mini pulled pork or roast beef appetizer sandwiches. It's an easy, basic biscuit recipe, and you can cook the onions a day in advance. Refrigerate them and make the biscuits the next day. In a skillet over medium-low heat, cook the onions in 3 tablespoons of butter, stirring frequently, until very soft and golden brown. Watch carefully and turn the heat down if the onions brown too quickly. Set aside and let cool. Heat the oven to 400 F. Line a baking sheet with parchment paper or a silicone baking mat. In a large bowl, combine the flour, baking powder, and salt. Stir with a spoon or whisk to blend thoroughly. Cut the remaining 5 tablespoons of butter into smaller pieces and work into the dry ingredients using fingers or a pastry blender until the mixture resembles crumbs. Add the milk and onions (including their melted butter used to cook the onions). Stir gently until all ingredients are moistened. On a floured surface, pat the soft dough out into a circle about 1/2 inch thick. Cut out with biscuit cutters and arrange on the prepared baking sheet. Bake the onion biscuits for about 10 to 14 minutes, or until golden brown. If desired, brush the tops of the biscuits with melted butter while they're hot. Makes about 10 standard sized biscuits. Or, about 12 to 16 with smaller (1 1/2- to 2-inch) biscuit cutters. Easy Cheddar Cauliflower Cakes are Low Carb and Gluten-Free!